Every time you call you’ll hear a friendly and educated voice excited to connect you to the expertise you need. With RVTECH the customer care continues! From monitored emails during weekends and free tech support, Chuck is always available for you! RVTECH is just as passionate about your RV as you are! 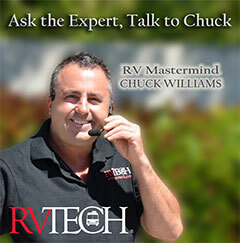 Leading the team is Chuck Williams, whose 30 years of extensive experience, knowledge, leadership, and technical training, have catalyzed RVTECH'S remarkable company growth and success. Be sure to stop in a spend all the FREE time you wish with Chuck or a member of our expert staff. All of your questions will receive sound solutions. Guaranteed! Stop in and enjoy RVTECH’s luxurious haven, featuring deluxe amenities including TVs, WIFI, delicious refreshments, FREE overnight stays, and much more! …Your RV shouldn’t be the only one getting upgraded and treated like royalty! 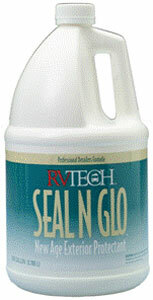 With hygienic technicians and clean repair facility, RVTECH will treat your home like our own! Frustrated with not receiving the personal attention and exceptional service you deserve? Exhausted from shopping around, only to find more unqualified technicians? With so many people aggravated with their RV service, you are not alone. Whether it be poor service, no real knowledge of the industry, poor attitudes, no return calls, lack of follow up, RVTECH has changed all of that! Imagine what it will feel like to walk into a gorgeous state-of the-art modern facility and see happy and knowledgeable professionals whose mission and joy is to fully exceed your expectations. Picture the piece of mind you’ll have knowing you can trust that every time you call you’ll hear a friendly and educated voice excited to connect you to the expertise you need. Wouldn’t it be amazing to take a breath of relief knowing you’ll be taken care of even after you pick up your RV? Ready to hear the great news? Your tedious and disappointing searches are over! At RVTECH, you can finally stop selling yourself short with mediocre RV service. Come in and see what it is like to get platinum service and complete product knowledge all conveniently in one place. RVTECH is the only RV service facility in South West Florida to offer air conditioned service bays so when RV Technicians are servicing your coach there is virtually no fatigue. The result? Errorless and hassle-free service that gets you back on the road fast. Eliminating the need to rush or take short cuts just to beat the heat, RVTECH service technicians remain clean and refreshed throughout the day so you and your RV remain their top focus and priority. And you can rest assured knowing only the cleanest and tidiest technicians are entering and moving your beautiful coach in and out of a bay. RVTECH treats your home as if it were our own. What this means to you is: RVTECH will deliver the highest standards of customer service…Guaranteed! And What this really means to you is: When you call RVTECH you can expect nothing but sound solutions from the most knowledgeable people in the industry we don’t have employees… I have a select, hand-picked group of experts who produce results… Guaranteed! And the reason I say that is BECAUSE we have done this consistently for 30 years and for thousands of enthusiasts just like YOU! Our Flagship Product, Clean Smarter! 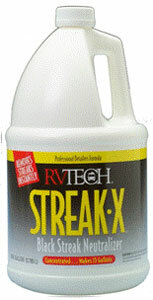 STREAK-X is a unique combination of high performance ingredients, our custom formula is guaranteed to safely penetrate, dissolve and neutralize unwanted black streaks from all motorhomes and travel trailers. 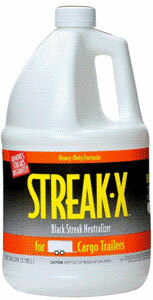 STREAK-X FOR CARGO TRAILERS is a scientifically developed, proprietary formula, that disintegrates all black streaks instantly and will not damage your clear coat, decals or aluminum! SEALNGLO is a ready to use protectant, producing a spectacular satin smooth, ordorless finish, a proprietary blend of select Carnauba waxes and micro-fine UV inhibitors, together provide critical interior and exterior protection. Keep It Looking Like New For Years! 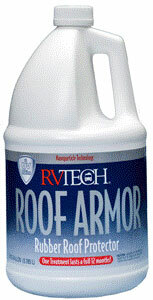 Roof Armor is a proven blend of Nanoparticle Technology with UV inhibitors, that provides outstanding protection on any RV and Race trailer with a rubber, metal, or fiberglass roof, to prevent drying, cracking, fading and the transfer of oxidation and black streaks. For Industry Top Secrets, Specials, & More, Join our VIP Club! Copyright © 2006-2015 RVTECH. All Rights Reserved.